Is TRD Trim on a Camry Like Jalapeño Jelly on White Bread? Can a vanilla model get spiced up properly? What do you think about when you hear the name Toyota Camry. Reliability, comfort, safety. Those probably hop to the forefront of your mind and not much else. Well, Toyota wants to change all that, and it started with the totally redesigned 2018 Camry. It's better-looking, better-driving, and just plain better than ever before. A huge departure from the boring Camry of old. Take another look. Yes, that's a Toyota Camry with black sport treatment everywhere. Well, Toyota just one-upped themselves and introduced a TRD (Toyota Racing Development) version of the Camry. That's really big news, folks. We're talking more than just a sport trim but one that's intended for the track. But is that like spicing up something that was never meant to be? Let's take a closer look. 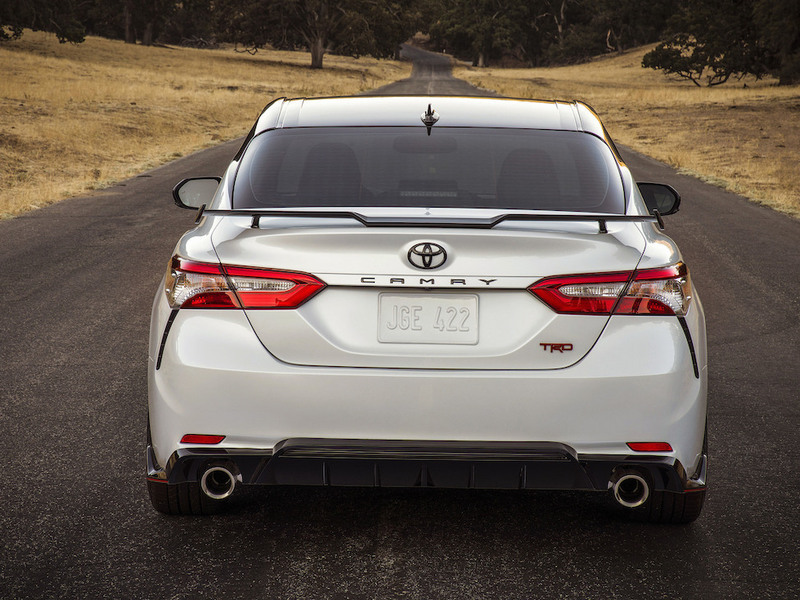 Based on the sporty-like Camry XSE trim, the TRD adds a lot more to the mix. The structure is more rigid by 44 percent in front and 57 percent in back, and the shocks get updated, as do the coil springs. There are also bigger brakes, dual piston brake calipers, 19-inch reduced weight black wheels with summer tires The whole car is lowered by 0.6 inches, and the idea is to make it handle and perform better than ever. The Camry already drives pretty well, so these are welcomed changes that, frankly, no one expects. There's a lot going on back here with the aero effects. That looks like a real diffuser. Though there's no power increase, the Camry TRD has plenty of power from its 3.5-liter V6 with 301 horsepower. TRD adds a great catback exhaust system, so the sound is more aggressive. The same 8-speed automatic transmission is the only one available for the Camry TRD's gear changes. The acceleration isn't eye-watering, but the Camry XSE will easily to a sub-6 0-60. No word on whether the TRD version has been geared differently for quicker sprints. We hope. Perhaps even more dramatic than handling capability boosts, the styling of the TRD is far more aggressive than the already mean-looking Camry XSE. Red and black body touches abound, big red brake calipers, rear diffuser, and massive wing make the TRD version just look menacing. Yep, a Camry, folks. The cabin also gets changes including black seats with red contrast stitching, red stitching on the dash, steering wheel, shifter, and doors. Even the seats get TRD logos, and there are brilliant red seat belts. The real question is how the new Camry TRD actually drives (along with the new Avalon TRD, which has similar changes -- see photos at the end of this article). Though we don't expect to see much faster sprints to 60, nor do we expect better steering feedback, it appears as though the Camry TRD will manage corners much better and provide improved high-speed stability. As mentioned above, Toyota also released the TRD version of the Avalon alongside the Camry TRD. It's as bold and aggressive as the Camry, and most of the treatments inside and out have also been bumped up. The grille on the Avalon was already bigger than the one on the Camry, and now the blackened treatment all over (including the side mirrors) complete the sporty look. This looks nothing like the Avalons that have come before it. No pricing is out for these new Toyotas, but both sell as 2020 models and are expected to hit showrooms in the fall of 2019. These are both great signs that Toyota is spending more time and money on more driver-focused cars, just like the new Corolla and Corolla Hatchback. Whether the changes will work to draw enthusiasts is another question. We'll see how the image change plays out over the next few years.